Ever since I was a kid, I always wanted to be Batman. Now I’m one step closer. 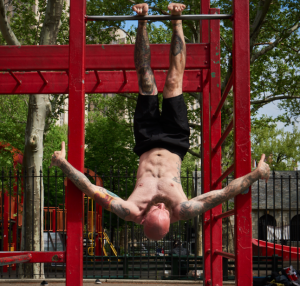 The calisthenics foot hang involves hanging upside down from a pull-up bar with no contact points other than the tops of your feet. It’s a fun and challenging exercise that can build foot and leg strength as well as confidence and mental fortitude. In the world of calisthenics, there are some exercises that you absolutely need to do: squats, push-ups and pull-ups, for example, are non-negotiable in my book. Then there are exercises that are “nice to do” – if you are interested. You can get in great shape without these moves, but they do have added benefits, and perhaps more importantly – they look awesome! I’m talking about things like the human flag, elbow lever and yes – hanging upside down from a pull-up bar by your bare feet. So how does one begin to train for such a move? The first thing I recommend is learning to do a toes-to-bar leg raise – even if you need to bend your knees a bit for now. Learning the toes-to-bar is a good prerequisite, as you pretty much need to be able to do this in order to get your feet in position to begin. It will also ensure a solid baseline of core strength, which plays a key role in the calisthenics foot hang. When you are ready to try, start by hanging from a bar, then lift your legs all the way up and hook your feet over the top of the bar. Aim to get as close to your ankle joint as possible in order to give yourself the best leverage. From there, slowly begin loosening your grip as you actively flex your toes toward your shins and squeeze your quads, shifting weight onto the tops of your feet. If you feel ready, try moving one hand from the pull-up bar onto one of the side posts that supports the bar. Eventually you will be able to take both hands away from the bar, instead holding onto both posts for support. From here you can progressively put less weight in your hands over time until you feel ready to remove them completely. Make sure you are actively maintaining tension throughout your body the entire time and remember to squeeze your abs. In fact, you may find it easier to hang in a sit-up position with your torso flexed forward at first. If you feel like you are starting to lose your footing, be ready to grab the side posts and lower yourself down carefully before you fall. However, I recommend making sure there is something soft beneath you, just in case you slip. Though the purest version of the move is performed barefoot, it may be helpful to practice with sneakers on at first. Just like the skin on your hands when you were new to pull-ups, the skin on your feet will need to get conditioned to supporting your body weight. And yes, you can get callouses on the tops of your feet if you spend enough time hanging from them. As is the case with all calisthenics exercises, a high strength-to-mass ratio is crucial to performing this move. With enough practice, you can eventually get pretty comfortable hanging in this position. Then you can try doing it while simultaneously tearing a deck of cards in half.